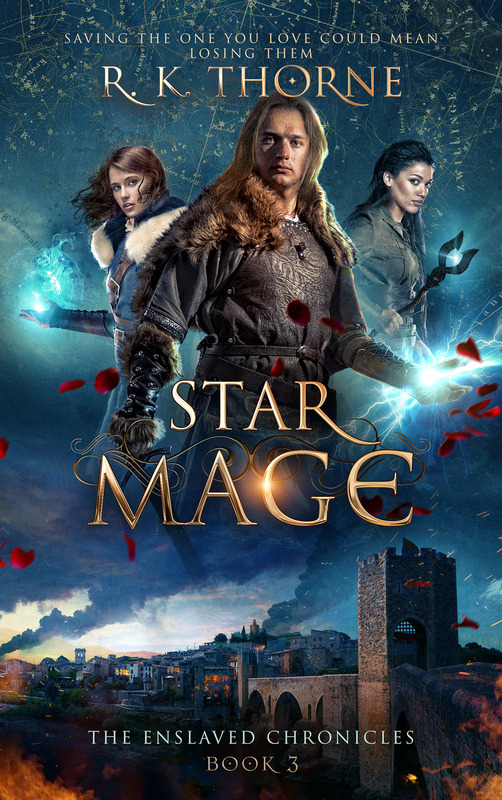 A warrior prince, an enslaved spy, a plot to draw the world to war. Of all the women in the world, why does he have to fall for this one? 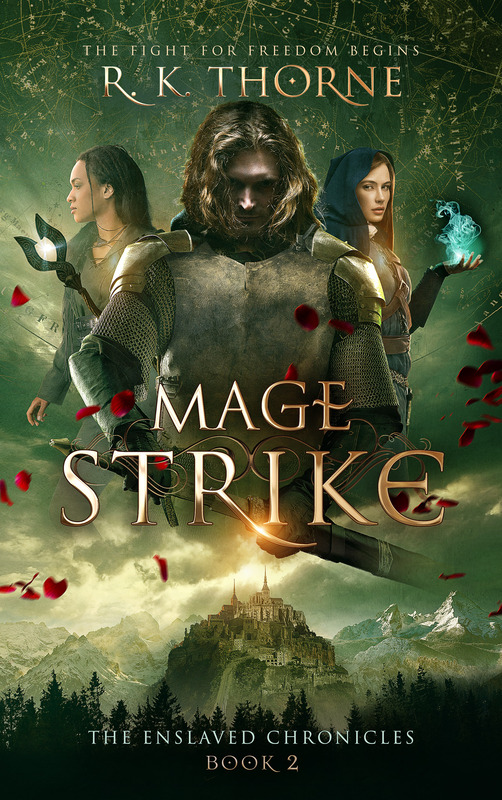 Magic, politics, love, and fate collide in the destinies of two people in this fantasy adventure from R. K. Thorne. 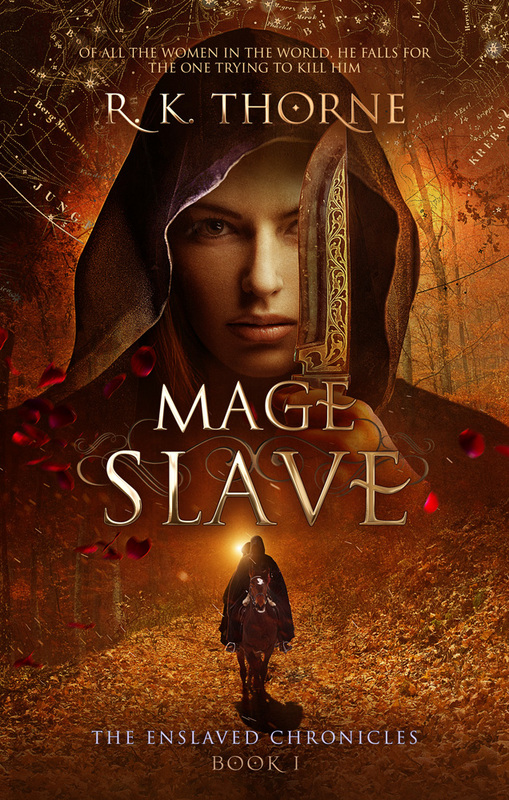 For lovers of swords and sorcery with a side of romance, Mage Slave is the first novel in the Enslaved Chronicles trilogy. Buy your copy now from your favorite retailer. Available in ebook, paperback, audiobook, and hardcover. “That’s it. Lift it a little higher, and you’ll be free,” Miara whispered to the raven. “What are you doing?” The raven lifted the latch and burst through the cage door just as the Mistress arrived. The truth would get her beaten, but as a slave, she couldn’t lie. So Miara said nothing. She watched silently as the raven circled up, heading toward a high window. If only it were that easy. Miara could change form and charm animals, summon plants and hear the thoughts of men. She could grow wings and take to the sky whenever she pleased. But at the edge of the hold’s lands, she’d be thrown back, kept forever a slave. She knew; she’d tried many times before. She’d looked for a hole, any chinks in her enchantment’s armor. There were none. “I’ll just get another bird.” The Mistress rolled her eyes as she strode to the dais. “Don’t think I don’t notice your petty little rebellions. They accomplish nothing. Show her.” She jutted her chin at a guard by the door, who took a bow from his back, notched an arrow, and dropped the bird with one shot. Miara winced and turned her eyes away. She could feel it was not quite dead yet, but healing it was probably one rebellion too many for the moment. “You are equally expendable.” The older woman stopped and folded her arms across her chest, regarding Miara. Her dark hair fell in carefully styled soft curls on a blue velvet gown, the picture of a lady. Miara knew better.